These 10 residential projects got our full attention this year. From a pared-back renovation to a luxurious indoor-outdoor pool, here are our best houses and condos for 2015. 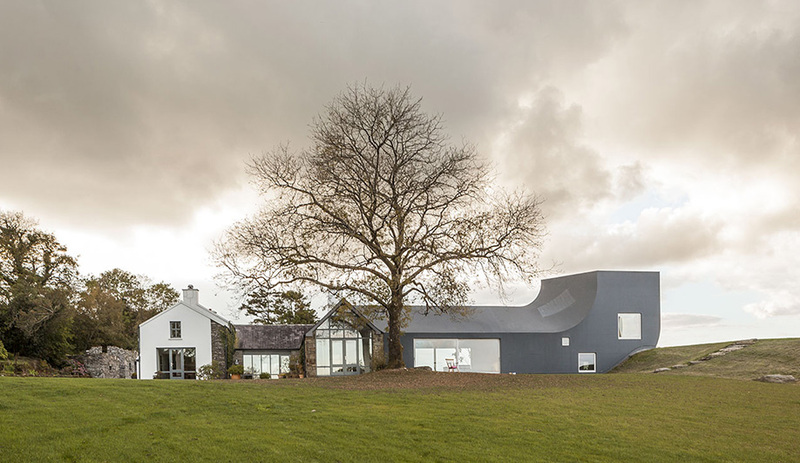 We’ve seen countless takes on the pitched-roof form, but nothing quite like this. 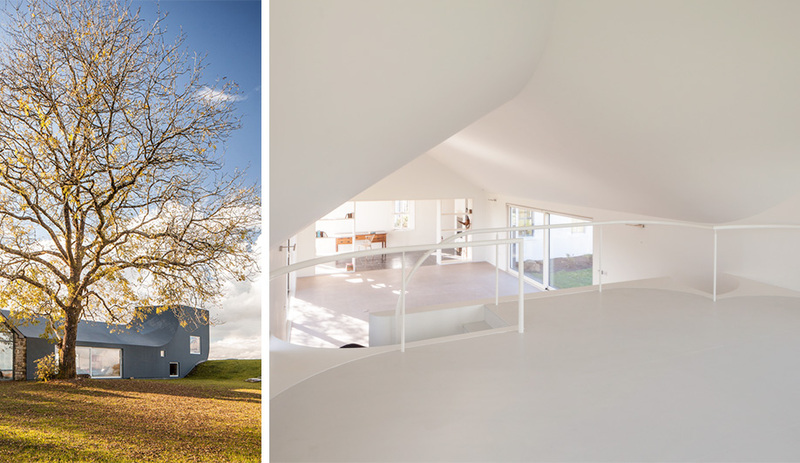 To extend a farmhouse in rural Ireland, Markus Schietsch of Zurich began with the same profile as the existing structure and extruded it laterally – nothing out of the ordinary there. At the north end of the volume, however, where it abuts a large ridge, the extension takes on a skyward trajectory. The plywood-on-timber structure was inspired by boat building and its cladding is in slate-grey plastic sheeting that defines it from the original house. Subtle yet whimsical, the swooping volume adds an entirely new dimension to an old stead. Inside, the interior is kept minimal with new living quarters leading to a master bedroom that occupies the new raised section, offering dramatic views across the landscape. 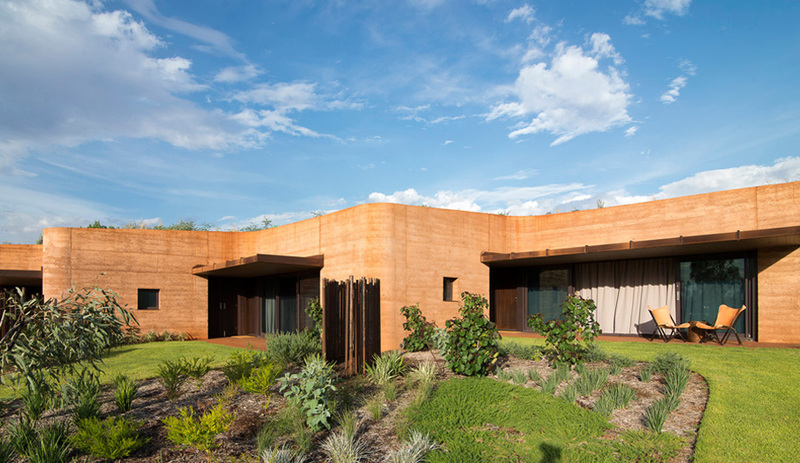 At 230 metres, the rammed earth facade of this row of 12 residences in Western Australian is quite possibly the longest of its kind in the southern hemisphere. The visually striking gesture is also an immediately identifiable sign of the building’s sustainability, but it’s much more than that. 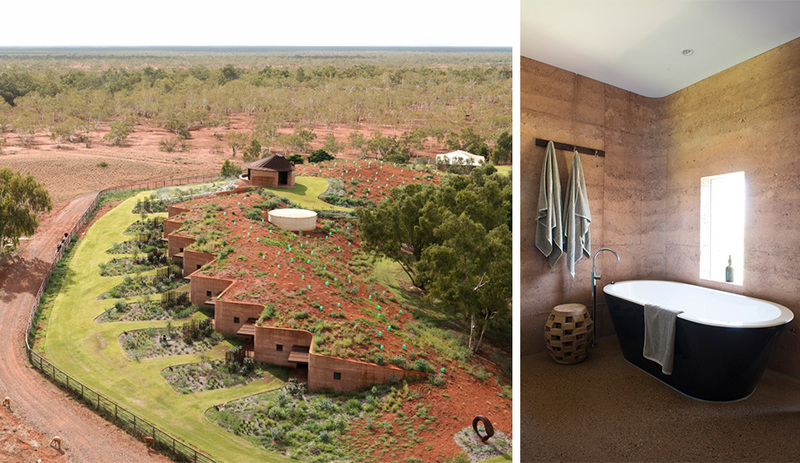 By using rammed earth as a bulwark against a sand dune, Luigi Rosselli Architects has created apartments that use thermal massing to offset the blistering heat of the remote outback. Deep awnings further mitigate heat gain, and offer a neighbourly place to build a community among the occupants – short-term workers based in a nearby cattle station during mustering season. The residence gained popularity this year, perhaps inspiring more rammed-earth builds on a grander scale. The big reveal that is Casa Dem is more than you could wish for: Located in Caviano, Italy, 14 kilometres from Naples, it doesn’t give away much at first glance. 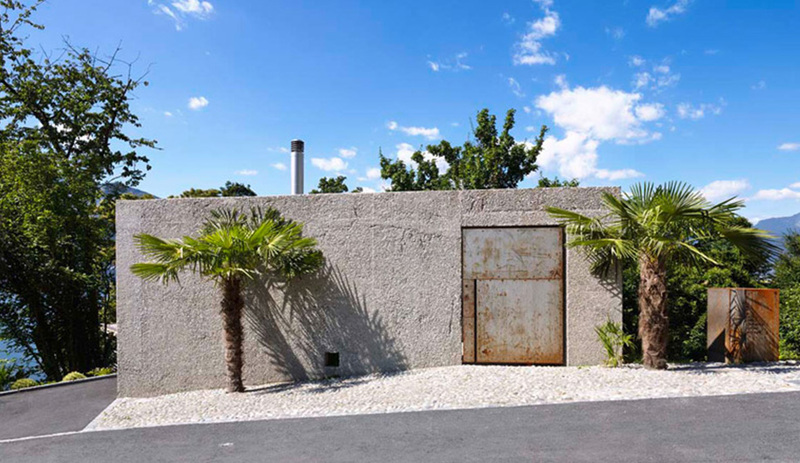 Facing the street, the two-storey house by Wespi de Meuron Romeo Architects reads as a modest single-storey volume, with an imposing (and rusted) metal door. One lone tree stands beside it. But, inside tells another story. Just inside, an indoor courtyard with seats cut deep into the concrete walls hints at what’s to come, with light streaming through square-cut windows and skylights. 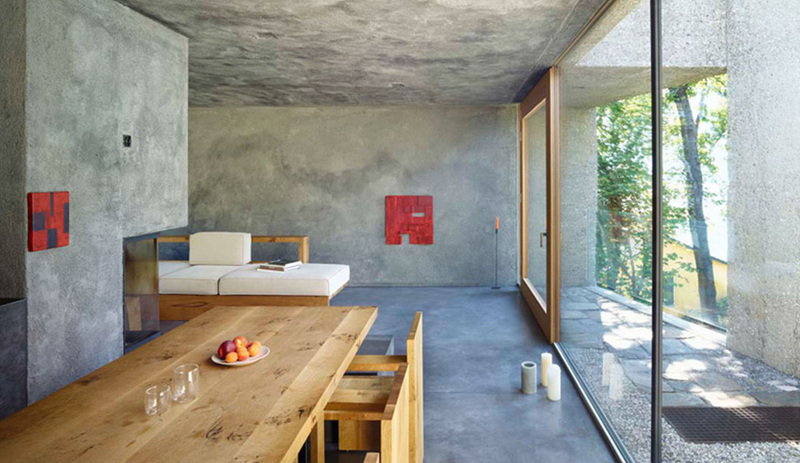 From there, the house descends two storeys into a deep valley with chunky concrete steps and rough-washed concrete walls creating a tactile and artistic envelope for a house that deftly integrates indoor and outdoor spaces. The steep site dictated much of the form including the unusual polygonal shape. Built for one of the firm’s directors and his family, the unique project surprises with its internal courtyards, comfortable living spaces and incredible views, easily making it one of our best houses of 2015. 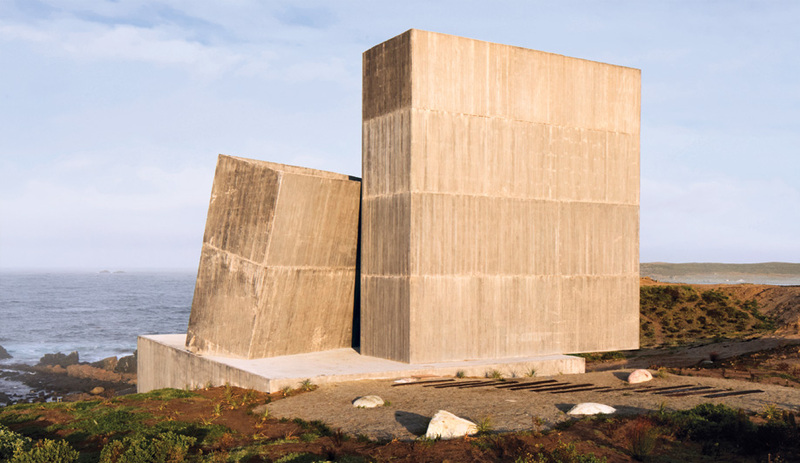 Alain Carle’s mandate for this house was eminently clear — it should have a harmonious symbiosis with its surroundings, emit no magnetic field and be free of wireless communications. Pushing it a step further, Carle, who is based in Montreal, promoted the value of its environment through advanced sustainable development, highlighting the rugged terrain instead of fighting against it. 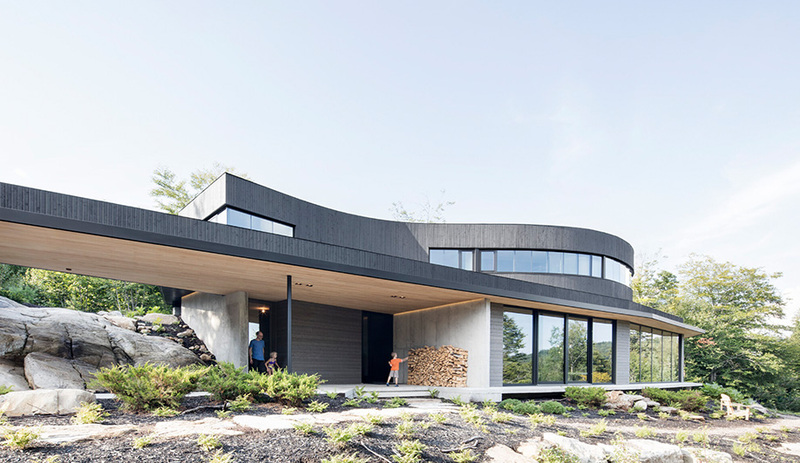 Situated on a steep slope in Wentworth, Quebec, the site had three large boulders that fortuitously formed a straight line, providing inspiration for the plan. The house was divided with the living spaces below the line and the sleeping quarters above it. 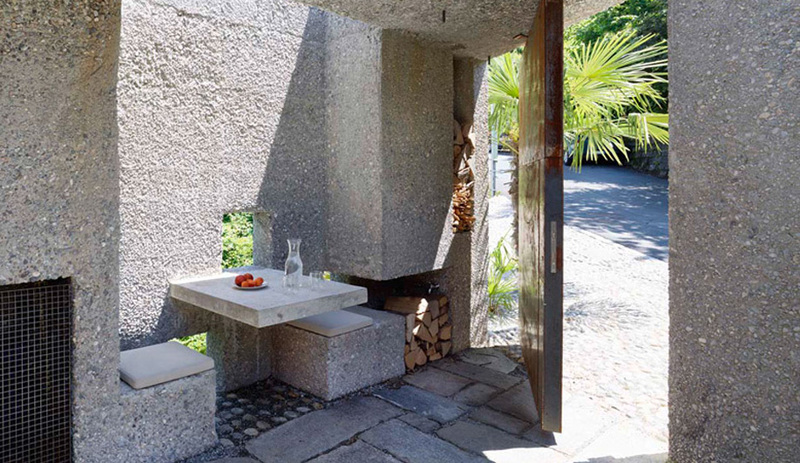 The resulting wooden pavilion, held up by concrete bearing walls and extending beyond the frame of the house to create outdoor areas, is both beautiful and functional. The outdoor living areas are protected from the harsh winter months and intense summer heat with the appealing organic lines undulating across the facade. As with everything in this house, the curves of the walls are not haphazard either, with the siting allowing them to capture the most solar power throughout the day and providing a dynamic backdrop to the outdoor spaces. 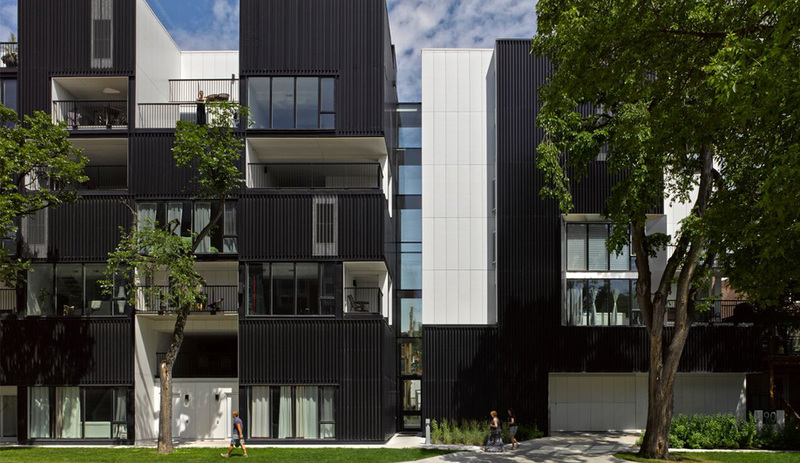 Dramatic silhouettes rendered in black and white are both eye-catching and timeless, as is the case with Oz condominium by Winnipeg-based 5468796 architecture. 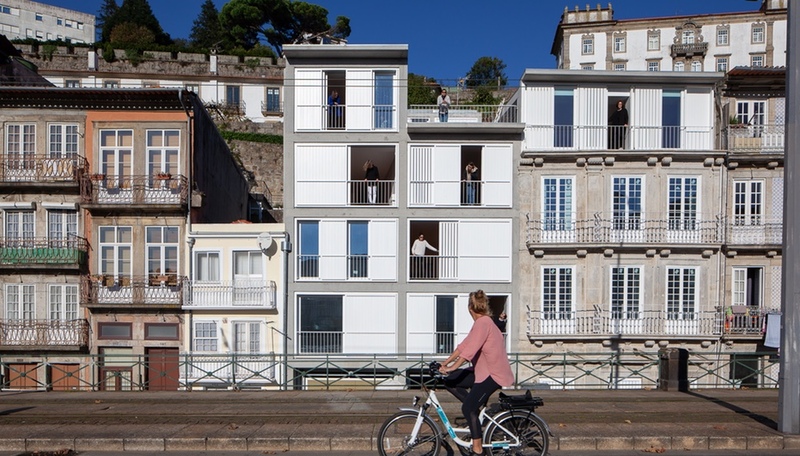 The 25-unit, five-storey building is clad in black metal, with cut-outs for outdoor spaces. That same cladding, made up of both solid and perforated panels, peels up and away from the building to cover the shared entry. The black panels cover up windows too, playing with light and shadow and providing privacy to some rooms inside. And where there is black, there is white — a balance of dark and light that softens the building streetside. The firm chose to make all of the recessed sections of the building white, playing foil to all that black. Set on an L-shaped lot, the building has two towers connected via a sleek glass-fronted entrance. One tower has ground-level townhouses that can also work as retail space fronting a busy street. 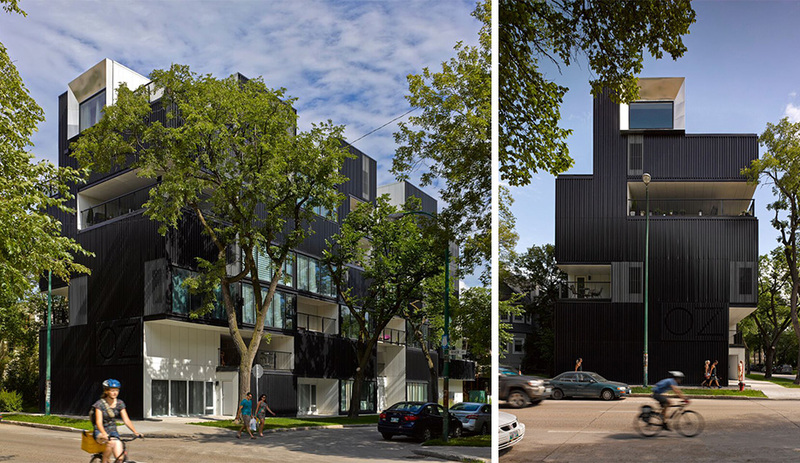 And a compact floor plan has created a project that contributes to urban density in the most favourable of senses with a human-scale design rife with mezzanines and courtyards, adding much life to this part of downtown Winnipeg. 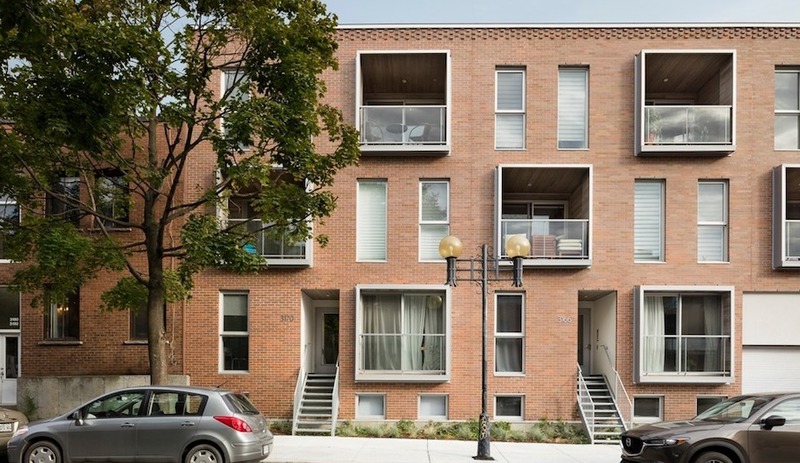 In Toronto, like many cities, it seems that modern is the way people are building. Most infill sites see a frame of black aluminum and ample glazing go up rather quickly. But, not all houses are created equal. Paul Raff Studio consistently raises the bar with its refined and thoughtful designs. The studio received much attention this year for their spectacular Echo House, a large-scale renovation of a Brutalist house that is now sensitive to its environment, the owners’ heritage and the site itself, not to mention its dynamic facade. 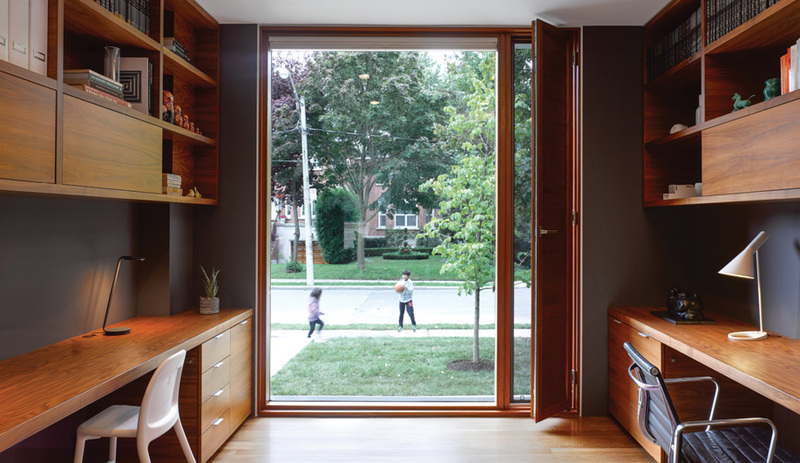 On our list is another of their Toronto projects, albeit a smaller, quieter one. Counterpoint House, built in 2014, gains a spot in our 2015 best houses list for its elegant materials, beautifully resolved finishes and ingenious touches. This urban house maximizes light and flow with a large south-facing clerestory window, and an effortless floor plan. 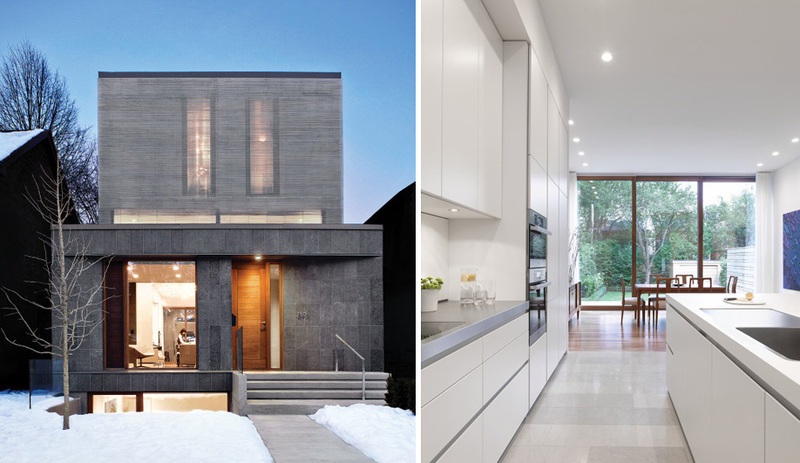 Besides it’s chunky grey-tiled exterior, a metal brise-soleil gives this house its unique presence. Effectively a screen of aluminum slats, it swaths the entire upper level. Inside the slats reflect the sun and create beautiful patterns of light throughout the day. Taking advantage of a breathtaking 651-square-metre plot, architect Joan Puigcorbé used a heavy hand when it came to glazing for this luxurious, low-slung structure. 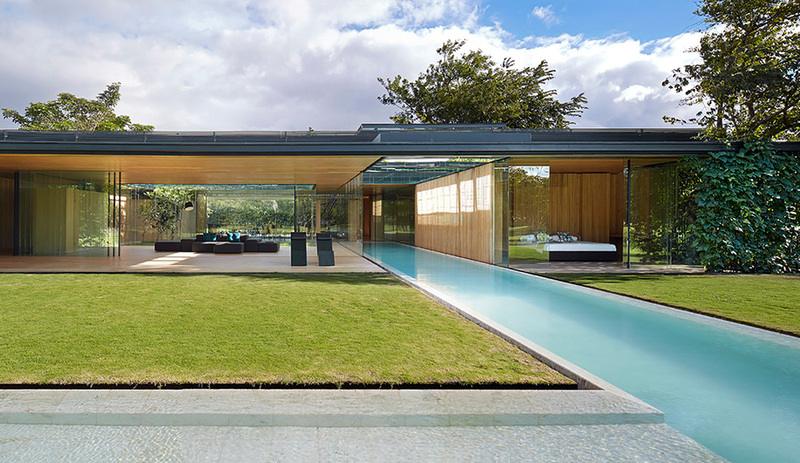 Made almost entirely of glass, the emphasis is aimed squarely on the views. 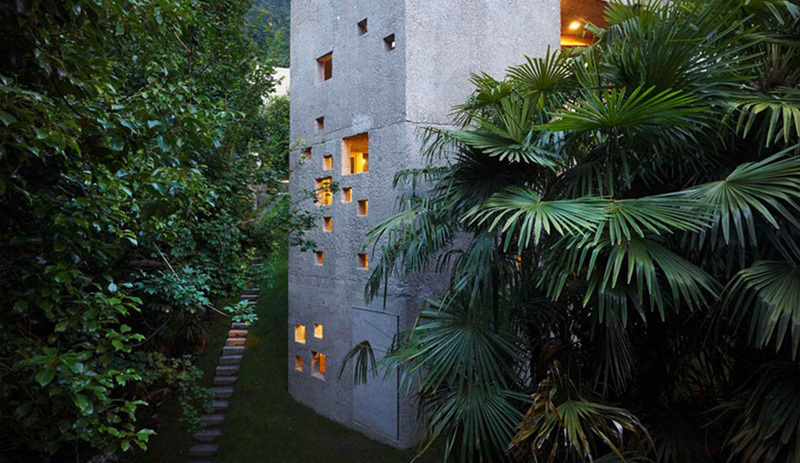 At the front, screens of vegetation and vertically suspended ropes obscure glimpses into the house, while still allowing light to pass through. 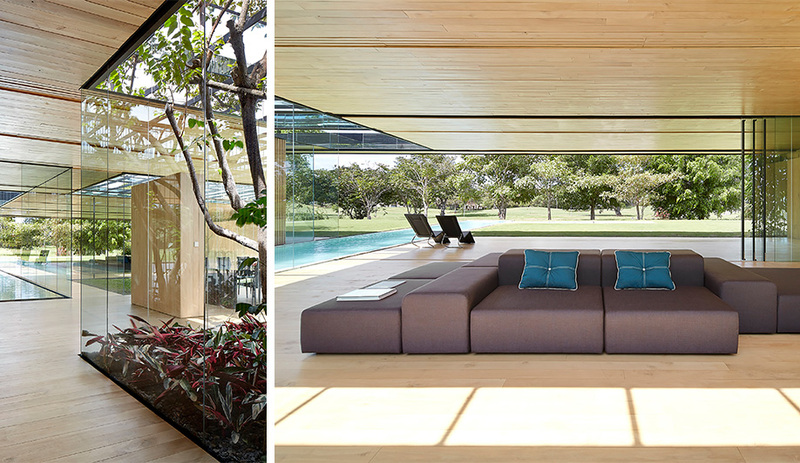 Out back, the division between inside and out is practically non-existent, with large expanses of retractable glass walls fully exposing the interior living spaces to nature. Flowing through both the exterior and interior is the home’s showstopping feature — a long, lean pool that reflects the endless sky and nearby sea. Bedrooms are situated along the perimeter with privacy maintained through planks of Melina wood cladding the walls. Puigcorbé also uses this material on the floors and ceiling throughout for a consistent aesthetic that doesn’t compete with the landscape. 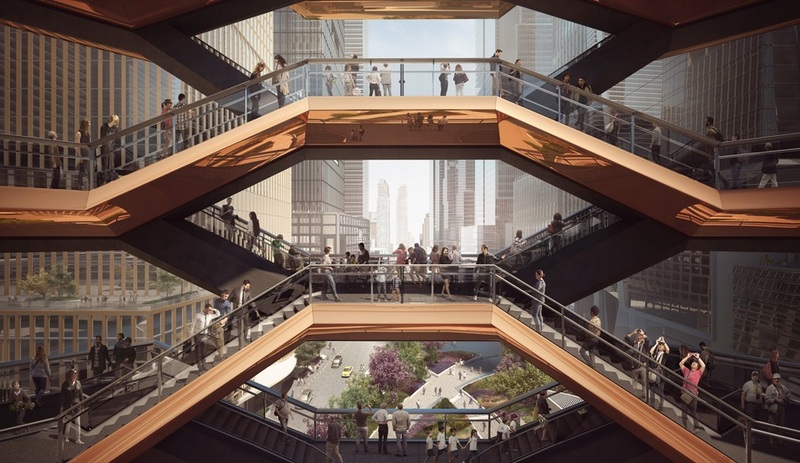 Trees that happened to be growing within the new-build’s footprint are encased in glass as living sculptures that strengthen the connection between inside and out. 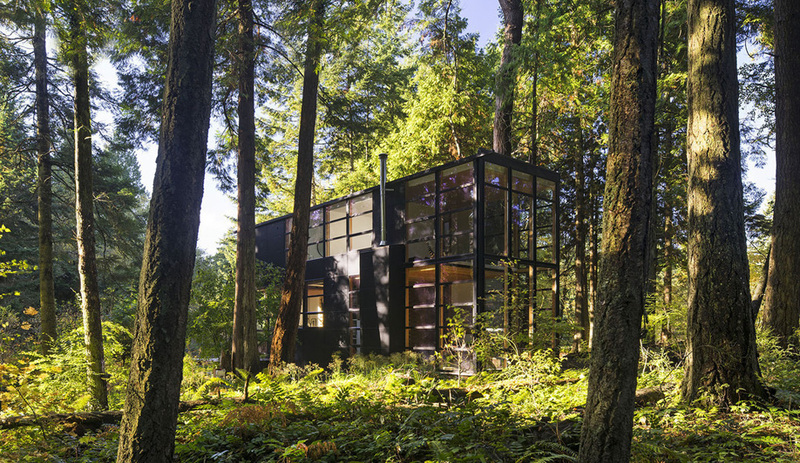 Budget restraints may be at the heart of what informs this getaway in the woods, with its workaday lumber, its aluminum window system and a 153-square-metre interior. 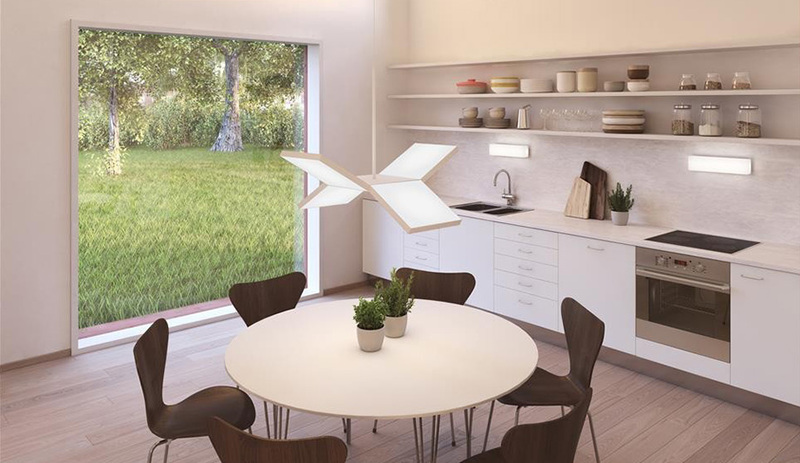 The modest scale and elements are also what give Lightbox its undeniable charm and serenity. 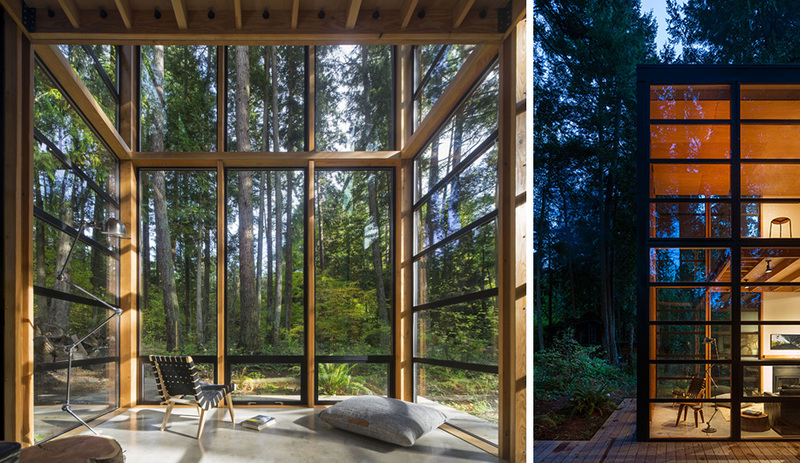 Located on a tree-filled lot off the coast of the Strait of Georgia, it was designed for Nic Lehoux, an architecture photographer from Vancouver whose shots have graced the pages of Azure for years. Bohlin Cywinski Jackson of Seattle agreed to swap design work for photos to help shave off some of the costs. Accessed via an extended wooden ramp, the main level is occupied by the kitchen, living room, a bathroom and storage. A mezzanine – intended as a bedroom but used as a tranquil sitting area – faces onto double-height glazing. There’s no need for blinds: the old-growth forest’s dense canopy that surroundings the space keeps the sun from getting too hot. There’s a lot to be said for giving people what they want. 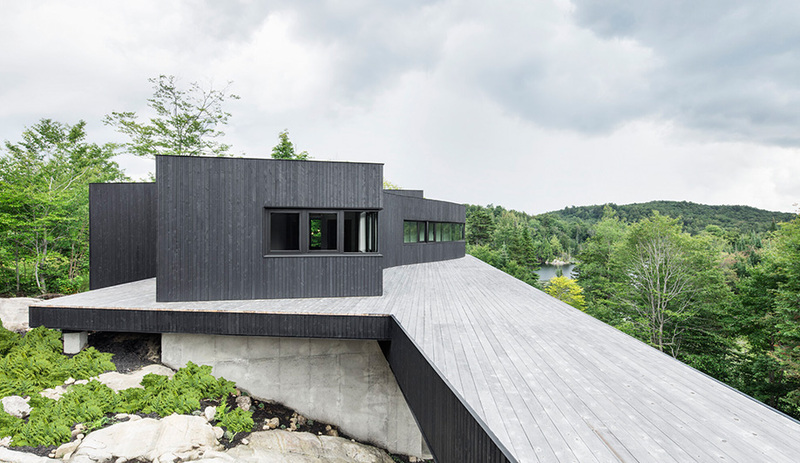 With the Hemnet Home – a collaboration between architects Tham & Videgård and Swedish real-estate website Hemnet.se, the client brief came in an altogether unique way: 200 million clicks on 86,000 listed properties. This crowd-sourced data was aggregated and crunched to produce the characteristics of the Platonically “ideal home,” according to the most-searched features, including the size, number of rooms and bathrooms and – of course – price. 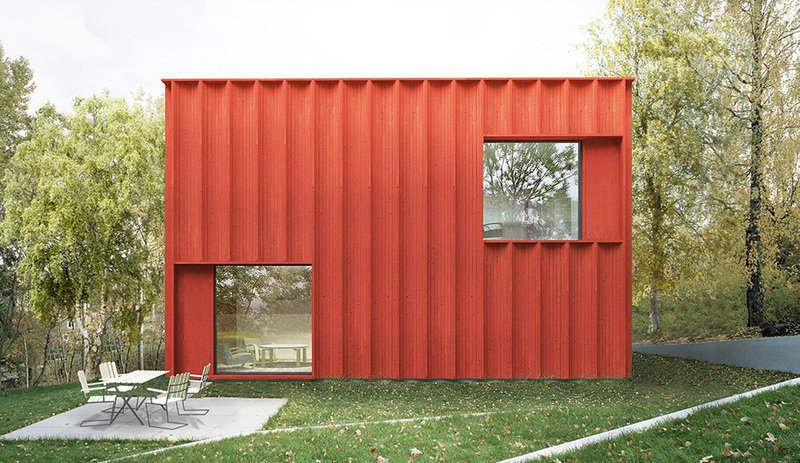 Starting with these specifications, TVArk combined two quintessentially Swedish archetypes: the little red cottage, and functionalist modern box. But while the team began with statistics, the execution is more art than science. An enclosed terrace on the second floor provides the much-sought-after balcony space without sacrificing equally prized privacy; a double-height volume on the ground floor, meanwhile, permits added light to flood the all-important kitchen. Although there’s only one Hemnet Home – for now – don’t be surprised to see the typology rolled out across Sweden in the years to come. 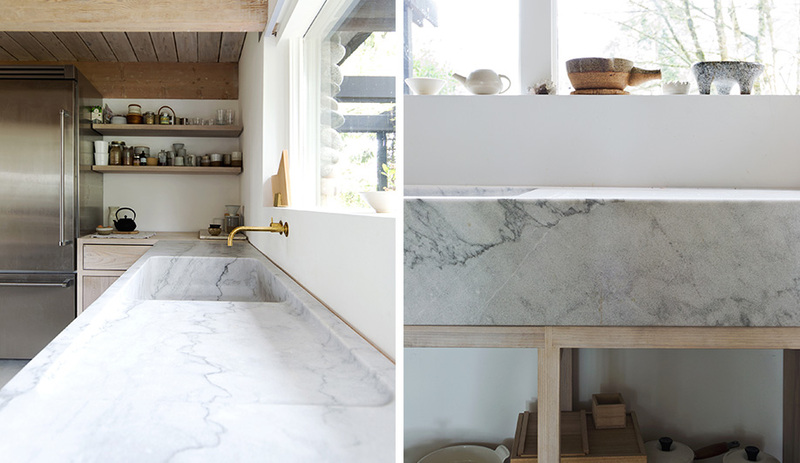 One of the most impressive features of this renovation in North Vancouver is its kitchen countertop where a sink has been carved out of a single block of marble quarried from Hisnet Inlet in Vancouver. Designed by Scott and Scott, the 800-kilogram stone rests on slender wooden legs with joinery strong enough to withstand the weight. Understated beauty like this is becoming a signature for the young Vancouver firm. 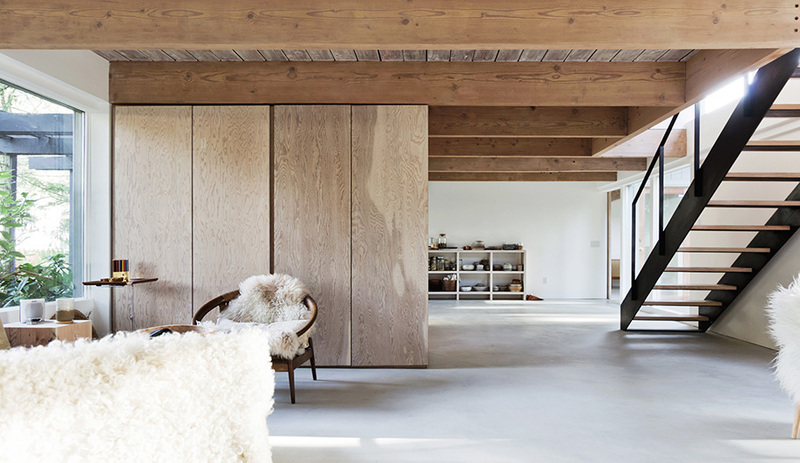 Raw materials are used everywhere in this project, from a staircase and fireplace made of steel to the lye-washed Douglas fir beams that define the main floor, which has been gutted of any interior walls to create a spacious, modern look. The supporting walls are finished in a natural lime-based whitewash and the storage units are concealed behind solid ash cabinetry. 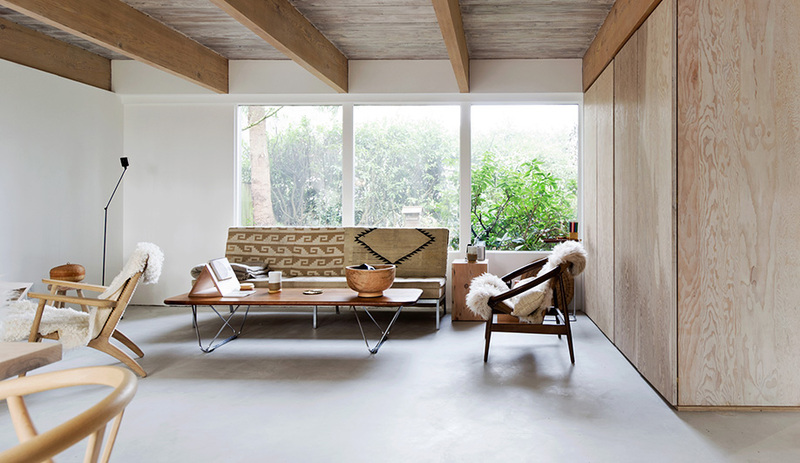 It’s hard to believe this Nordic-styled interior began as an unremarkable post-and-beam house, circa 1950s.